With a towel as my cape and a t-shirt emblazoned with the Teenage Mutant Ninja Turtles, I once paraded around my public housing estate’s playground like a superhero. But even with my cape, I never dared jump off the playground’s seemingly sky-high platform for fear of being exposed as a fake if I landed on the sandy grounds and hurt myself. So while the other kids jumped off what was a great leap of faith for me, I always took the slide down as if heights was my kryptonite. Alas the children living in my estate today no longer face this dilemma. The plain concrete equipment was replaced some years ago. Today, the brightly coloured plastic equipment no longer towers over the children and they can only climb into it from stairs and get off via the slide. And even if they fell off some how, the kids would land on cushioned rubber flooring instead of sand. On top of that, Town Councils that maintain public housing playgrounds favour such modular systems because they cost less to maintain. A 2004 guide compiled by 14 town councils run by the People’s Action Party called for more of such playgrounds because defective equipment could be easily replaced. Taking it one step further, the guide also discouraged flexible elements such as cargo nets and climbing ropes in playgrounds because they spoilt easily and were costly to maintain. So what has resulted is playgrounds that are too safe, not in touch with nature and do not stimulate creative thinking, says the public. That was why Singaporeans voted for playgrounds to be revamped when DesignSingapore Council polled them for ten poorly-designed public facilities in 2007. We should take this lack of fun seriously. After all, it is at play, writes Swiss philosopher Jean Piaget, that a child acquires new knowledge and constructs reality. Besides school and home, playgrounds are probably the place that our children spend most of their time in. Thus playgrounds take on a vital role in shaping how they grow up to be. Our playgrounds today are cookie-cutter and instructive — climb up, slide down… then repeat the cycle again. The designs leave children with very little to imagine and explore. With its generic look and conservative safety standards, the playground is designed to be safe for everyone but fun for no one. So it’s not a surprise to see children at a playground run up the slides and jump off the steps. They play around the equipment in a feeble attempt to re-imagine what little there is and they may even unknowingly endanger themselves this way. One of the earliest calls for public playgrounds to be built in Singapore’s housing environment came in response to children’s safety. In July 1959, after the Minister for National Development ordered the conversion of all vacant spaces on the island into children’s playgrounds and public parks, an editorial was published in the Sunday Times calling on the government to not forget the “little playgrounds” too. Since then, the design of public playgrounds here has grown with the nation. In the 1970s, with Singapore just emerging from nationhood, playgrounds contained nothing more than functional slides, swings and seesaws with mild steel structures as obstacle courses. As Singapore prospered from the late 70s, more elaborate playgrounds inspired by animals like dragons, elephants and spiders were built. A small number of them are still standing in old estates. More thought was given to playground designs from the 1980s. To appeal to children, some were built around nursery-rhyme themes and shaped like rabbits and tortoises while others resembled fire engines and clocks to play on childhood fantasies. Local identity also came to the forefront when playground equipment resembling bumboats, trishaws and kelongs were built. Choa Chu Kang New Town, which was developed from a rural farming area, also had playgrounds designed around fruits and vegetables. 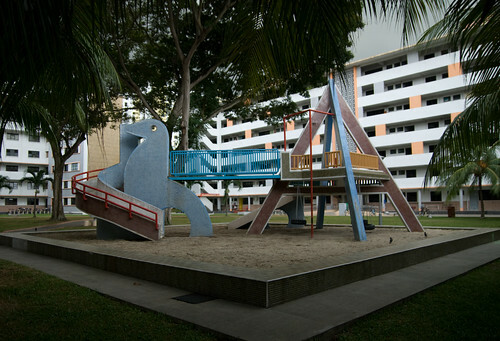 Come the 1990s, the modernisation of Singapore saw global culture influence our playground designs. Inspired by the cartoon series Teenage Mutant Ninja Turtles and the elaborate sets of hit movies like Jurassic Park, cylinders, bridges and walls were introduced. Today, our playgrounds, which are designed by private consultants, resemble those found in developed countries all around the world – a sign that globalisation has entered the very centre of our heartlands. To the HDB, the playground today is not just child’s play, but part of a bigger site known as the “family playground”. Thus, playground equipment is now co-located with sporting and recreational facilities such as fitness corners and courts to cater to adult family members who often accompany their children to play. In this way, playgrounds become “a conducive environment for residents to mingle and interact [to] enhance neighbourliness and community bonding,” says Ms Tay. But can this expanded definition counter questions over the playground’s relevance in our public housing environment today? In 2007, a resident suggested to the government’s Cut Waste Panel to reduce the number of playgrounds because they were too many of them and were under-utilised. The government in its reply said that feedback on playgrounds have thus far not been adverse and pointed out that its 2003 HDB Sample Household Survey showed that some 45 per cent of families with young children up to 12 years old used the playground at least once a week. Even so, today’s playgrounds have to compete against the onslaught of alternative entertainment outlets for children such as cartoons, gaming consoles and the Internet. Thus, children are increasingly likely to stay indoors, leaving these nerve-centres of the housing estates abandoned. Facing similar problems, playgrounds in the United States are now emphasising “free play” – unstructured time in which kids create their own scenarios, cooperate and assess risks – to stay relevant. Such playgrounds usually contain many mobile blocks of all shapes and sizes to allow children to create their own play environment. Considering how structured school has become, such playgrounds may be the only place where our children can explore their imagination. Closer to home, architect Tay Kheng Soon and World Toilet Organisation founder Jack Sim have come together to create Kampung Temasek to get children outdoors. Based in Johor, this outdoor nature playground aims to let children interact with nature and get in touch with the past by experiencing kampung life — letting them play with animals, go on hikes, climb trees and pluck fruits. While play is very much alive, the kind of space and how we allow our children to do so must change to suit these times. The first playgrounds concerned themselves with just safety and containment, but tomorrow’s playgrounds need to bring children out – not just to the physical space but also to where they can imagine and explore too. See more photos of playgrounds here. “Cut Waste — Suggestion Detail.” Government of Singapore, http://app.mof.gov.sg/cutwaste/suggestionview.asp?id=39115. “Room to Play and Breathe.” The Sunday Times, July 26 1959, 10. This article was first published in Singapore Architect #252.
interesting take, got me reminded of this photo someone shot last year. i guess it wasn’t the only dragon playground left. even so, those are really ancient playgrounds.. their kind of the oldest version from our childhood – i always thought the progression was from dragon –> swings and see-saws –> rubber and slides only. or perhaps that’s just how i remember it. Also in the pipeline, updating this article with a more detailed history and I might have tracked down the designer who created these playgrounds. Stay tuned! Have you found the designer who created the playgrounds? would love some more background on these classics! Hi QW, interesting photos you’ve got there. Yes, I’ve tracked down Mr Khor Ean Ghee and had a chat with him. Yet to sit down to write a story and get it published somewhere. Stay tuned! Great stuff! Looking forward to get more info on these playgrounds then! I’m doing a paper on these old playgrounds as well. is it ok to quote you for my paper? sure. You might be interested to know I’m publishing more materials about playgrounds soon. Sometime in May, I hope.